Getintothis exclusively reveals The GIT Award 12 shortlisted artists ahead of the showcase night at Leaf on Friday April 27. 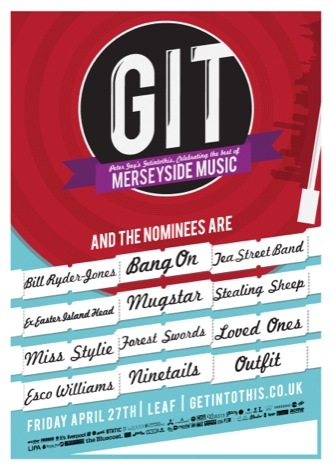 It has been a significant year for musical creativity and diversity on Merseyside and this has been confirmed by the 12 acts shortlisted for the inaugural GIT Award 2012. 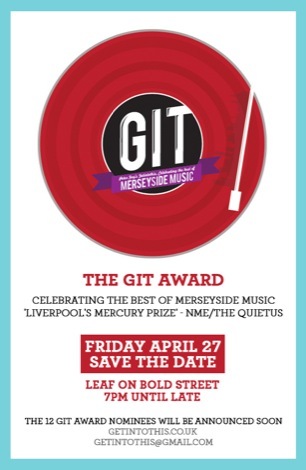 GIT Award founder and chair of judges, Peter Guy, said: ‘The first GIT Award shortlist highlights the wealth of new musical talent within Merseyside. 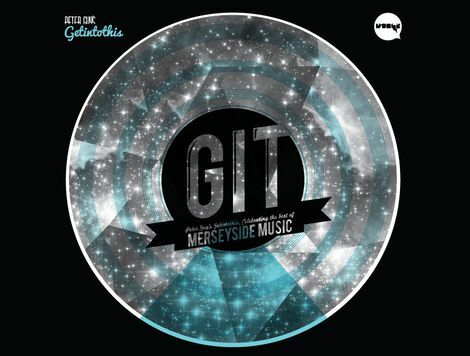 Since its launch at Liverpool Music Week‘s closing party in November 2011 up until the closing date at the end of February 2012, the GIT Award received more than 380 entries. The overall winner will be announced at The GIT Award 2012 Show on Friday April 27 at Leaf on Bold Street, where each of the shortlisted artists is expected to perform while being filmed exclusively by Mocha and Liverpool Football Club TV. Journalist and Goldblade musician John Robb will host the evening. The winner will receive an incredible prize which includes recording time at Liverpool’s Sandhills Studio and a showcase at this year’s Liverpool Sound City and Liverpool Music Week. Kevin McManus, former NME journalist and director at Liverpool Vision, said: ‘We’re really happy to support the GIT Award.